Claude Monet's water lily paintings are among the most iconic and beloved works of art of the past century. Yet these entrancing images were created at a time of terrible private turmoil and sadness for the artist. The dramatic history behind these paintings is little known; Ross King's Mad Enchantment tells the full story for the first time and, in the process, presents a compelling and original portrait of one of our most popular and cherished artists. By the outbreak of war in 1914, Monet, then in his mid-seventies, was one of the world's most famous and successful painters, with a large house in the country, a fleet of automobiles and a colossal reputation. However, he had virtually given up painting following the death of his wife Alice in 1911 and the onset of blindness a year later. Nonetheless, it was during this period of sorrow, ill health and creative uncertainty that - as the guns roared on the Western Front - he began the most demanding and innovative paintings he had ever attempted. Encouraged by close friends such as Georges Clemenceau, France's dauntless prime minister, Monet would work on these magnificent paintings throughout the war years and then for the rest of his life. So obsessed with his monumental task that the village barber was summoned to clip his hair as he worked beside his pond, he covered hundreds of yards of canvas with shimmering layers of pigment. As his ambitions expanded with his paintings, he began planning what he intended to be his legacy to the world: the 'Musee Claude Monet' in the Orangerie in Paris. 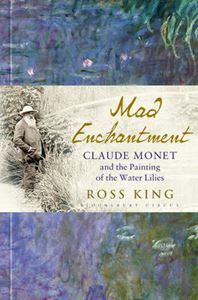 Drawing on letters and memoirs and focusing on this remarkable period in the artist's life, Mad Enchantment gives an intimate portrayal of Claude Monet in all his tumultuous complexity, and firmly places his water lily paintings among the greatest achievements in the history of art.